My gg grandparents. 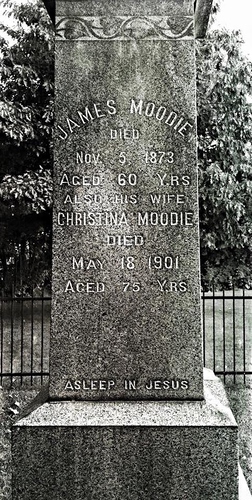 Parents to Ida Rosales Moodie. Hello! Thank you for your scans!! It's really interesting. I'm looking for information about schnauzers at or after war for long time. I glad to see this foto. Feel free to use it with a credit. Hi just found these photos after googling George Balfour Jedburgh. I have a childs book with his name and Jedburgh written in it, dated 1829. Could this be your George Balfour? Hmmm... George was born in 1812, so if it was his, he would have been 17... He seems a seems a bit old for a children's book. But I would be interested in knowing more about it. Marilyn passed away a number of years ago. It was nice to see her picture. Just got done washing some of her pottery that was in her house fire that I helped clean up for her. Prominent agriculturist of Center Township, residing on section 8, is one of the old settlers of Monona County, coming here in Sept 1859 with his father's family. When about 8 years old, his family moved to Ohio; from there to Henry County, Ind. after two years they returned to Ohio. In the spring of 1846, he came to Hancock Co., Illinois, where they lived for about nine years. He was engaged in farming; at the expiration of which, with the family, he came to Iowa, settling in Polk County. In the fall of 1859, they made a settlement in Monona County, on sections 8 & 9. For ten years, he assisted his father carrying on his farm. Finally removing to a house which he had built on section 8, he commenced the cultivation and development of his own place, and is now the owner of a beautiful farm of 417 acres, 160 under culture. When he came here, he had but one team and $40 in money. His stock alone now is represented by ten head of horses, 75 of cattle, and 100 hogs. He married Mary A (Kelley) Muckey on March 24, 1869 and they had 12 children. Twins died at an early age (Edmund & Edward). Believe Freeland also died young. Involved in starting the Castana Creamery in 1889. Sometime prior to 1868, the Bouslaugh schoolhouse was built. It was located in Center Township. . . . . . .
Family records have them getting married on Feburary 21, 1866 in Center, Monona, Iowa and having 13 children. You are right. For some reason, I always type Williamstown and not Williamsburg. It never fails... Thanks!! Would you happen to have a photo of this ship?? Thanks. I have added the photos just after the photo of Uncle John aboard ship. I also updated the link. I appeared to have the wrong links in the first place. The Heronpool was built in 1903 and the previous link was for a shi built in 1926. I did find a photo online. There are a number of sites that list ships and their histories. If you Google the name you shoud come up with it.